It was the show that defined a generation. And thanks to constant re-runs, Netflix, and catchy one-liners, Friends is still going strong more than 14 years after it went off the air. 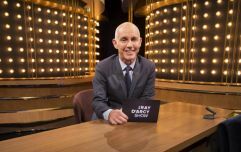 Even though we will always have a soft spot for the six cast members, it's been hard not to notice some of the small errors that cropped up on the show in recent months. Like when the camera cut away to a new cast member (by accident) or the fact that Rachel looked alarmingly different in her passport photo when she was flying to Paris. And now Friends fans have picked up on another error in the beloved sitcom - this time, involving Monica's wedding dress. 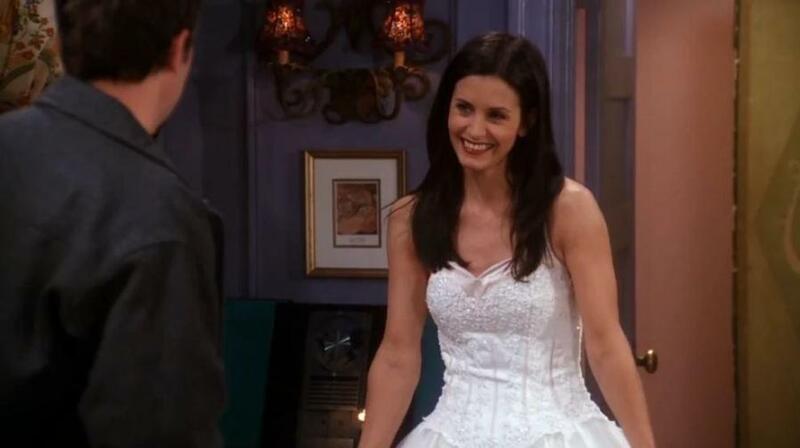 In the season seven episode The One With the Cheap Wedding Dress, Monica gets into a fight with fellow bride-to-be Megan Bailey - who is after the exact same wedding dress as her. When the pair meet at a discount bridal boutique in Brooklyn, Monica is furious because the pair first met while they were looking at the 'same' dress in NYC. 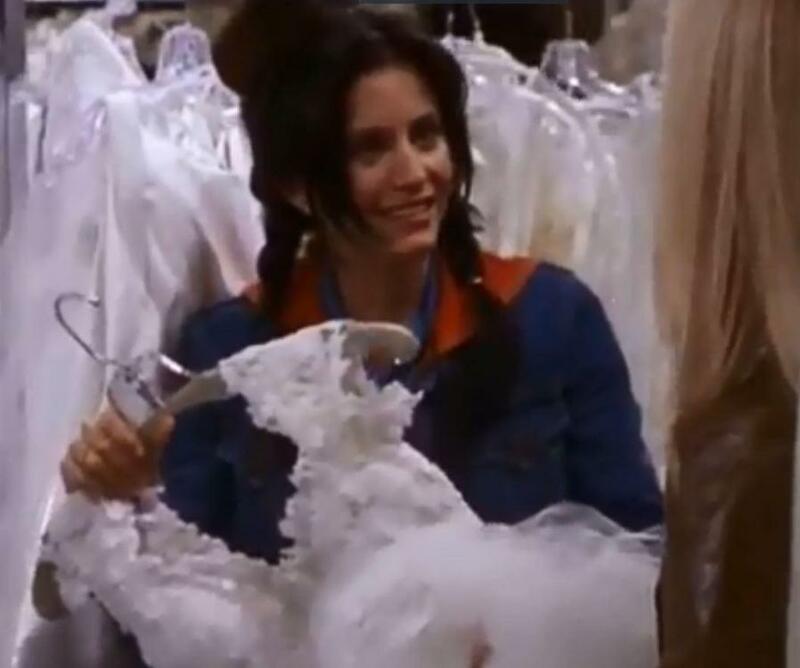 Monica ultimately ends up 'winning' the dress (with some help from Phoebe and Rachel), but eagle-eyed fans have noticed an issue with her bargain bridal wear. It's not actually the same dress he was trying on before. The original one had a halter neck, with beading along the bodice. The one they were fighting over had a sweetheart neckline and was lace. And when she gets back home and shows Chandler the dress (which she ended up having to give up so they could get the Swing Kings), she's back in the original dress. A superfan took to Reddit to point out the error, asking if it drove anyone else "crazy". "In the One with the cheap wedding dress, Monica tries on one dress at the expensive shop, then fights with that girl over a different dress completely - every time I see it, it drives me crazy!" "When she shows Chandler the dress at the end of the episode, isn’t it the first one again too? (Right when they scurry back into the bedroom after she says she’s returning it)". 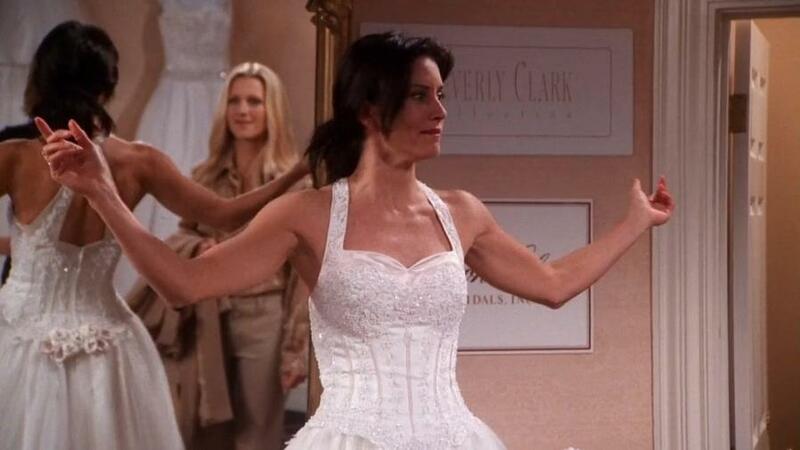 Someone else pointed out that Monica wasn't the only one with a magically changing wedding dress. "Similar issue with Emily’s wedding dress...Monica picks it up for her, then wears it while doing dishes, etc., then the dress Emily actually wears for her wedding is a completely different dress...not even close to the same style! "Maybe Monica spilled beer on it something, idk."